County Cab is pleased to offer our corporate charge accounts to businesses throughout Baltimore County. With the convenience of our monthly billing statements you can track numerous employees’ cab usage and receive one combined bill for the month. Once you have signed up and your application has been approved, County Cab will issue numbered cab vouchers which are assigned specifically to your account. 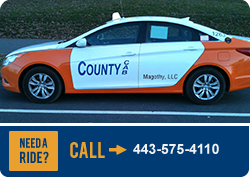 These vouchers can be used for County Cab, Arrow Cab, Baltimore City Cab, and AA Cab Connection. To use the vouchers simply issue them to your employees; your employees then sign the vouchers, total the fare and gratuity, and hand them to the driver. The driver will then give the employee a copy of the voucher as a receipt. At the end of the month a statement will be mailed to you including copies of all of the vouchers used during that billing cycle. Your accounts payable department should easily and quickly be able to reconcile our statement to your files.